The MEF-CECP program has gained tremendous traction in the industry with a growing pool of certified professionals in over 440 organizations across 84 countries. The following testimonials from companies that are leading the industry with the highest number of MEF-CECPs, speak on the benefits derived from having these Carrier Ethernet subject-matter experts in their respective organizations. The MEF Network Foundations program is just getting started, stay tuned for MEF-NF, MEF-SDN/NFV and Network Expert testimonials! Spectrum needs no introduction. The company has a distinguished history and stellar industry reputation for its technical innovations and service excellence. Time Warner Cable rebranded as Spectrum and merged with Charter Communications and Brighthouse Communications and is, in fact, the second largest provider of video, high-speed data and voice services in the United States, and a household name connecting 15 million customers across 29 states to entertainment, information and each other. Spetrum Enterprise, previously Time Warner Cable Business Class (TWCBC), offers data, video and voice services to businesses of all sizes, cell tower backhaul services to wireless carriers and enterprise-class, cloud-enabled hosting, managed applications and services. TWCBC has long been one of the leading providers of Carrier Ethernet in the US. In January 2014, TWCBC became the first provider in North American to earn all eight MEF CE 2.0 certifications for its services – underscoring the company’s ongoing commitment to provide its customers with reliable, highly-scalable, world-class Ethernet services. This staunch commitment also extends to its employees—the people that design, sell, deploy and support TWCBC’s Carrier Ethernet services. TWCBC has adopted a company-wide strategy to ensure that its key employees obtain thorough Carrier Ethernet training and MEF-CECP certification. 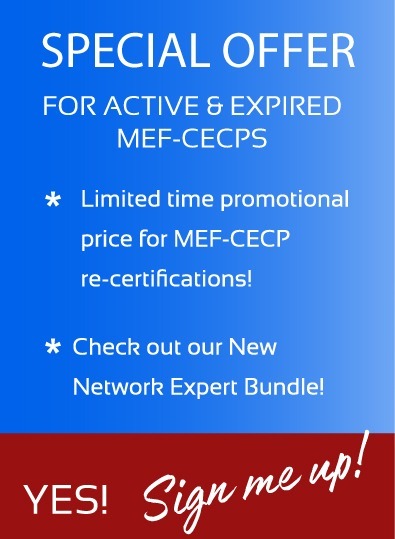 The MEF-CECP is the industry’s first vendor-neutral certification program and demonstrates that the professionals who have passed this rigorous certification have acquired the key competency and skills to design, market, deploy and support Carrier Ethernet equipment, networks, and services that represent the next generation of telecommunications technology. To date, with well over 300 MEF-CECPs, TWCBC is in the top two positions with the greatest number of MEF-CECPs—an achievement that began in 2011 when the company first started training its professionals for the MEF-CECP exam during the pilot phase of MEF-CECP 1.0. Without a doubt, TWCBC is demonstrating to the industry and its customers that it has the most qualified professionals in the Carrier Ethernet industry backing its products and services. According to Lance Hassan, Principal Network Engineer at TWCBC’s, MEF-CECP training and the ensuing certification has made a significant impact on the company. The training provided a much deeper understanding of MEF services and how customer needs may be met with standards-based CE 2.0 services. This has enabled a faster time to market with new services, not to mention fewer issues during the MEF certification process. Hassan concludes, "MEF certifications have solidified the company’s industry leadership position within North America to deliver all eight MEF-defined carrier Ethernet services. They are key to the Carrier Ethernet business at Time Warner Cable; they enable peers within the commercial business to communicate effectively, and offer new services to customers in a more efficient manner." Level 3 Communications is a premiere global communications provider of communications services to enterprise, government and carrier customers. Anchored by extensive fiber networks on three continents connected by undersea facilities, its global services platform features deep metro assets reaching more than 500 markets in over 60 countries. In October 2014, Level 3 acquired tw telecom—a company with an extensive North American footprint and deep expertise in building out metro networks in the United States. Today’s new Level 3 is well-positioned to navigate the evolving communications landscape, and continue to provide excellent customer service and solutions for today and tomorrow’s IT challenges. Level 3’s vision is to be the trusted connection to the networked world. One of the key ways the company chooses to accomplish this vision is to train its staff and arm them with deep industry knowledge. In 2012, the MEF’s Carrier Ethernet Certified Professional (MEF-CECP) program was identified as an integral component of Level 3’s Ethernet deployment, and a necessary certification for its Sales Engineering teams. "Level 3 has been an industry leader in Carrier Ethernet Services and our Engineering Staff have been the tip of the iceberg in that success," explains Al Myers, Vice President Sales Engineering at Level 3. "In today's environment of APIs, Logical Interconnects and Global Connectivity, we believe it’s vital that the Carrier Engineer understands the details behind the WAN deployment when evaluating customer applications. More importantly, they need to educate our customers and community about Carrier Ethernet’s vast capabilities. Our 285+ MEF-CECPs are Carrier Ethernet subject-matter experts, in every sense of the word, and this growing talent pool of professionals is proving to be a substantial and measurable force in our competitive landscape." From the individual perspective, Level 3’s MEF-CECPs have made gains with personal success in their day-to-day work citing improved efficiency and productivity. They have also been able to immediately leverage the knowledge gained through MEF-CECP training and certification to provide the best service possible to their customers, whether it be in a consultative or maintenance role. With the growing numbers of trained and certified Engineering Professionals that are well-versed in vendor-neutral as well as vendor-specific technologies, Level 3 stands well-equipped to lead its customers and their applications into the next evolution of Carrier Ethernet Services. Looking forward, Myers said: "As Ethernet continues to evolve, Level 3 Engineering will evolve with it and certifications will continue to play a major role. Without a doubt, the MEF-CECP program is an enabler for our customers to receive consistent messaging, consistent network deployment and, ultimately, a great experience." PLDT, a member of the MEF and an important contributor to MEF work over the last several years, is the largest Carrier Ethernet service provider in the Philippines delivering retail services based on EoSDH, EoMPLS and native Ethernet to a domestic network of over 6,000 Ethernet nodes. PLDT also has a significant international network and is the Philippine telecommunications provider with the most number of PoPs (seven in five countries) in key countries and cities in the Asia Pacific region, United States and United Kingdom, each with global-class Ethernet nodes based on the same world-class quality as PLDT’s own MEF-certified domestic network. It also boasts ownership of the most submarine cable landing stations in the Philippines. Covering a range of vertical markets in the Philippines, PLDT's brand is highly visible, and so the company invests heavily both in technology and personnel to ensure the quality of its products for its customers. PLDT recognizes that one of its vital assets is the people who deliver their Carrier Ethernet services throughout their service lifecycles - from pre-sales to after-sales, from concept or planning to operations. Getting appropriate training and exposure to global standards through MEF-CECP certification allows PLDT engineers to, for example, interpret client requirements more effectively, translating those requirements into a standard industry language and thereby enabling PLDT to meet their customers' expectations. Achieving MEF-CECP certification also allows PLDT staff to collaborate more confidently with other global service providers, which ultimately results in new revenue opportunities derived from international network interconnections and interoperability. To date, PLDT has 66 MEF Certified Professional employees whose responsibilities range across the whole service delivery process such as pre-sales, provisioning, network planning/engineering, operations and after-sales support. PLDT's MEF-CECPs have demonstrably contributed to the company's ability to deliver faster service turn-up times resulting in faster ROI and revenue realization, as well as providing assurance and credibility for PLDT's customers that their Carrier Ethernet service is in good hands. Part of the global, Indian-based, US$100Bn Tata conglomerate which has a diverse portfolio that includes auto and steel manufacturing, communications and consulting services, Tata Communications is the largest undersea cable provider in the world, and the largest network solutions provider in India. The company has leveraged the strong position India has in in data centers, call centers and voice communications infrastructure to develop global communications partnerships, and from that, Carrier Ethernet services now form a significant and fast growing part of the Tata Communications product portfolio. There are now 120 MEF-CECPs at Tata Communications, providing substantial benefits to the company through consistent use of terms and methodology across the Carrier Ethernet organization, representing business customer and service provider partner requirements based on MEF service descriptions in customer requirements and RFPs - streamlining service delivery and partner relationship development.